This summer has been dreadful from a sailing standpoint. I haven't done any. Its September 14, and I still haven't been sailing. I did put the boat in the water on Monday. I checked the cockpit drain hose which I had replaced, and lo and behold it was leaking very slightly. It was just damp, but still, it was leaking. I decided that I didn't want to risk leaving it in the water without fixing the problem so I pulled the boat back out of the water and left it on the trailer at the marina and redid the caulking and hose fittings yesterday afternoon. So now I'm ready to sail. Hoping to do that this afternoon although there is a chance for rain. I did get to sail for about three hours yesterday. The bilge is dry under the cockpit drain hose that that looks good. My neighbor Bo went with me and we had breezes that ranged from dead calm to maybe 10mph. The weather was perfect - overcast and about 75 degrees. 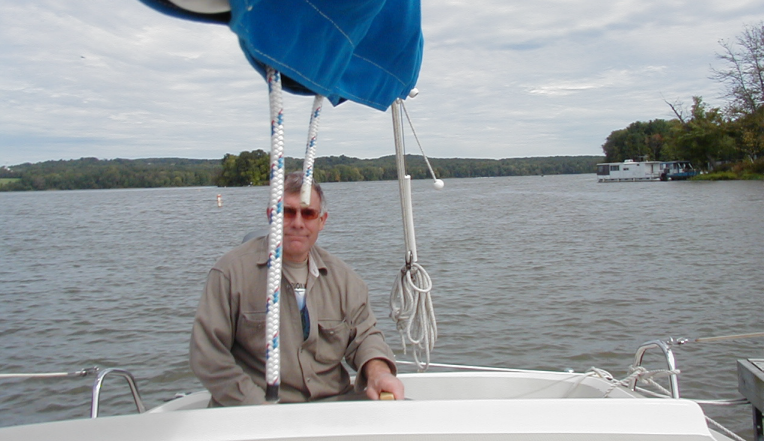 I left the boat at the dock at the marina and so hope to sail several more days this week and maybe next week too. Oh, also, I'm picking up a Sunfish sailboat today. A friend is giving me one. I'm interested in it, because you can put it in the water in 10 minutes and be sailing. John and I went sailing this afternoon. The weather was perfect - a little cool but not cold. We sailed for an hour and half. I got a measurement for making up a wisker pole, and I had the GPS along so I was able to check our speed. We hit 6.0 mph at one point. Theoretical hull speed is 6.27 mph. Here I am, waiting for John to arrive. I also put on the new boom vang and it really worked out nicely. The bilge is still dry under the cockpit so the re-sealing work did the trick. The motor works great. I'm really liking this little boat. Connie & I went out this afternoon and then brought the boat home. We had it out of the water, folded up and on the road in about 35-40 minutes. That is quite good I think. She was a good helper! I have to admit that the sailing was more stressful today. I'm not sure why. There were more boats on the lake and at a times a stiff breeze. We hit 6.3 mph at one point. I don't know for sure why I was feeling stressed but I was. Maybe just anticipating taking the mast down, but that turned out to be really easy with Connie's help. I'm also getting tired of sailing back and forth on this little lake. I remember that from last year. I don't know if it would feel different on a smaller boat or not. Maybe I can get the Minifish out yet this year if we get a really nice warm day.